14k Gold and Sterling Silver Sail Boat Jewelry. 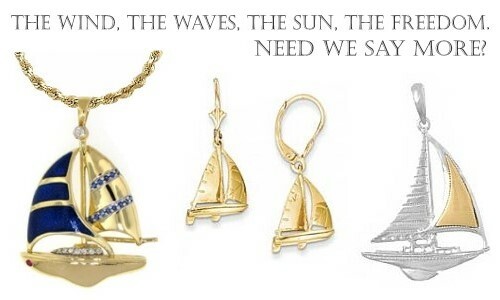 Search our selection of gold or silver sailboat jewelry to find the perfect gift for the sailor in your life. We have many styles to choose from with charms, pendants, earrings and bracelets. From single mast sails to three sails, we have a wide selection of sailboat jewerly for the perfect gift for the nautical boater. Sailboats are classy and we love how these look.